Scheduled releases occur on weekends beginning the Friday following Labor Day. See the Army Corps' web site for the scheduled dates, times, and flows. The Lower Gauley is big water. It can also be tons of fun. After a short warm-up with a few small play waves you will see a huge rock on River right and the river will drop out of sight. That's Koontz Flume, the first of several class IV/IV+ rapids on the Lower G. There is a sneak on far river left. The biggest hazard with the sneak is the possibility of meeting up with boaters in the eddy at the bottom waiting their turn to play in 5 Boat Hole. The more conventional line is to run on river right but well left of the huge undercut rock. One obstacle that catches some paddlers is a sticky hole just above the main drop. There is a tongue to the right of the hole and left of a smaller rock that forms an eddy on river right. You can catch the eddy behind the smaller rock and above the huge rock or you can paddle back to the left after clipping the upper hole and catch the green water that takes you on a roller coaster ride down to the bottom of the rapid. If you go for the river right eddy just above the rock make sure that you make it. There has been at least one fatality when a boater swam on the eddy line and was flushed into the undercut. The next major rapid after Koontz Flume is Canyon Doors. It is in a slight bend on the river with beautiful rock cliffs on the right. There are a couple of big rocks in the middle of the river with most of the flow going to the right. The eddy behind the rocks is a nice resting spot before deciding how to run the rest of the rapid. 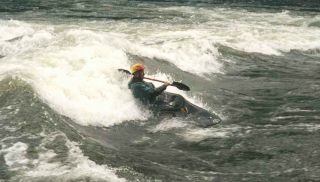 At levels around 1000-1500 cfs there are some great surfing waves between the rocks and the river right shoreline. After Canyon Doors comes Junkyard. Then things quiet down for a while before you get to Psuedo Mash and Twisted Sister. You will recognize Twisted Sister as a squirrely spot on river left where the squirt boaters play. Next come the Mashes. Upper Mash is a great rapid for eddy-hopping while working your way from river center to river left. Catch the big eddy on river left at the bottom of Upper Mash and watch the action at Lower Mash. From the eddy you will see a big rock in the middle of the river with plently of water going around both sides. The rafts go to the right of this rock. Just below the middle rock is a bigger rock on river right with all of the water going left of it. One line from your eddy is to ferry across behind the middle rock and paddle hard to the right to get close to the rock on river right. If you do it right you will clip the right corner of the holeby the big rock and end up in an eddy on river right. Another line is to go down river left- just make sure to work you way back to the center of the river so you don't tangle with the rock on river left at the bottom of the big drop. If you run the center, you will encounter two big wave holes. The next horizon line signals Diagonal Ledges. During Gauley season you will see several boaters in the river left eddy at the bottom of Playtime (aka Hawaii 5-0) waiting for their turn at some great surfing. Watch out for traffic coming down river when it's your turn to jump in the hole. The ledges area is a common lunch spot for many of the raft companies. A bit further downstream is Gateway to Heaven (also called Pearly Gates or Heaven Help You). The preferred line is between the big rock just left of center and the ledge on river right. If you get too close to the big rock you will find some really funky water. Rocky Top is the next major rapid. Just below Rocky Top is Chicken Ender on river left. Next comes Upper and Lower Stairstep. I prefer to run the left side of Upper Stairstep, catch the eddy on river left above Lower Stairstep, and work my way to the river right eddy as I go over the first drop in Lower Stairstep. The eddy is interesting because it gives you a nice view of Riverwide Hole. There is a sneak around the right side of the hole by going out the shallow, rocky bottom of the eddy. Or you can try to peel out and clip the right corner of Riverwide. Or you can stay just left of center from the top and go through Riverwide. Just don't aim for the center. Or have plenty of speed to avoid stalling out and getting sucked back into Riverwide, unless, you like to do big backenders. In the next 3 miles or so you will get to run Rollercoaster, Cliffside, Rattlesnake, and Roostertail. In Roostertail stay left of center and left of the rock in the middle at the bottom. There is a nasty pinning rock/ledge at the bottom to the right of the rock in the middle of the river. After the pool below Roostertail the river will make a bend to the right. This signals the top of Pure Screaming Hell (class IV+). The easiest line at PSH is to run just to the right of the big rocks that are in the water on the left of center. Then catch the first big eddy on river left. At normal levels you will see a small pyramid shaped rock in the water at the bottom of this eddy. Go just to the right of that rock with slight left angle and catch the next eddy. From this eddy you can easily see just how big Hell Hole is. From here you can sneak left of the rock just below the eddy or go right of the rock and left of Hell Hole. Beware of trying to go river right at PSH. The big rock at the right side of Hell Hole is severely undercut. Don't be fooled and think that all you have is flat water from here to the takeout. Some folks do and get surprised by Kevin's Folly. After that it's flat water to the takeout. Putin: Take Peters Creek Rd. off Rt. 39 at Lockwood. During Gauley season (early September through mid-October) the last mile or so of the road to the putin is closed. You have to carry in down the stairs and the last part of the road. Takeout: Across from the church Off Rt. 39 at Swiss or drive a mile up the road that goes past the church and park across the rr tracks to save a mile of flatwater paddling. 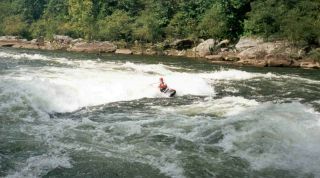 Click here for the Middle Gauley, and Click here for the Upper Gauley. Beware the eddy on river right at the beginning of this rapid! It sits just above an undercut rock which has been the site of at least one fatality. Best is to begin middle left, avoiding some pourovers, and then motor left of the hole at the end. Careful with this one: the hole tends to shove the unwary paddler into a sieve on river right. I've always used the Gauley at Belva reading to cover this section rather than adding the Summersville Release and Meadow together. Thjis takes into account other tributariies, most notably Peters Creek but innumerable smaller ones as well. For example, on 3/25/05; the Gauley at Belva was 17,772; the combined gauge 16,209. The Lower Gauley is a different experience at higher levels. Commercial raft trips put on (or used to anyway) at levels up to 15k or so. The river changes character above about 7000, and there was a fatality at high water sometime in the early 90s, but it's pretty awesome, not that hard, and lots of fun at higher levels. Rapids that are very different above 9k or so include Canyon Doors (chaos in its first drop), Lower Mash / Diagonal Ledges (all one awesome rapid; scout or follow someone who knows the route, and stay way the heck to the right! ), Heaven Help you (scout! ), Stairsteps (benign, but ten or so of the biggest pyramid waves east of Lava Falls), and PSH (the highwater hole is on the inside of the left turn). River Incident Prompts Paddler Alert Location: Lower Gauley, approx. two-thirds of the away down this section, specifically below "Cliffside" (river left) there is an obvious strainer just downstream.... BUT 50yds further downstream is a submerged strainer just below the surface. Description: Several strong, fairly large-diameter tree trunks/limbs pointing up-stream are not visible at "Sat Sept. 21 release level" yet high enough to pin and wrap a boat on. Incident: one kayak maneuvering across in the medium/light current momentarily broached on the submerged tree trunk and in attempting to rotate off to avoid pinning, the trunk popped over the gunnel and pinned the paddler rather firmly to the bottom of the boat and, with the force of the water on the hull, began to sink. Alert assistance from two other paddlers allowed the pinned paddle to get air before going down to rip his leg from around the trunk and swim out through his skirt (which remained pinned) about two minutes later. It took four paddlers and ropes about 15 more minutes to raise and free the boat. Help AW With Our Critical Fundraiser: Gauley Fest! The flow reported here is from the USGS gauge at Belva (below the takeout for the Lower Gauley). This reflects what was being released from Summersville Dam 7-8 hours ago plus what was coming in from the Meadow River 5-7 hours ago and what was coming in from any other streams below Summersville Dam. Another view is to look at the virtual gauge for the Gauley below the Meadow. This gauge is the sum of the current flow from Summersville Dam and the current flow from the Meadow River. It does not include the flow coming from any other creeks below Summersville Dam. Gauley Fest is coming up September 17th - 19th and it's time for vendors to send in their registration forms. The National Park Service shares an open letter to boaters regarding what to expect this season on the Gauley River (WV) including the recent acquisition of a parcel of land at upper Swiss that provides a public take-out on the lower Gauley. The rangers and staff of the Gauley River National Recreation Area have provided the boating community with a letter outlining what's in store for this year's Gauley season. As in previous years and to help with boater parking at Mason’s Branch, American Whitewater has leased the Legg field for additional space. Gauley Fest is the world's biggest paddling festival and American Whitewater's biggest fundraiser - but we need your help! Please sign up to volunteer and become a part of the Gauley Fest Volunteer Team! It's a fun and easy way for you to be a critical part of an amazing festival. The rangers and staff of the Gauley River National Recreation Area share an open letter to boaters regarding what to expect this season on the Gauley River (WV). Gauley season is just around the corner and in preparation for fall releases American Whitewater received the following open letter to boaters from the rangers and staff of the Gauley River National Recreation Area informing boaters of planning efforts for this season. American Whitewater received the following open letter to boaters from the rangers and staff of the Gauley River National Recreation Area. The letter outlines important river information for upcoming fall releases. Earlier this summer West Virginia was hit hard with massive flooding. Both the Gauley River and Meadow River watersheds were flooded by heavy rains. The Gauley River set a flow record and Summersville Lake recorded the second highest lake level in its history. Downstream, nearly every boat launch and take-out was damaged to some degree. Despite the flooding, the put-ins and take-outs at the Tailwaters, Mason’s Branch, Wood’s Ferry, and upper Swiss will all be open for Gauley season. Read an open letter to Gauley boaters from the rangers and staff of the Gauley River National Recreation Area. There are no federally-owned access points below Gauley Dam. This means that your public river access is provided at the whim of several benevolent landowners who have agreed to work with American Whitewater and allow you to trespass for a few weeks every year on scheduled release weekends. Please take a few mintues to review the access rules for the Upper and Lower Gauley.